With a seemingly almost prescient knowledge of their short lived fate, the modus operandi of most Game Boy competitors seems to have been to release as many titles as possible in as short a timeframe as possible, under the seemingly misguided belief that quantity of software was what made for a system seller. At the same time, it doesn’t appear to have been entirely lost on developers (at least those working on the systems not called the Watara Supervision) that familiar franchises also play a big part in the discerning gamer’s selection process. The end result is that, perhaps appropriately on a system seeking to piggyback on the Game Boy’s success, a good percentage of its titles are clones of existing big-hitters of the day. With this in mind: welcome to Bomb Blaster. Despite having cover art that is more reminiscent of an issue of popular eighties comic ‘Commando’, Bomb Blaster is actually a clone of Hudson’s classic cutesy maze traversing franchise, Bomberman. This doesn’t have to be a terrible thing. The timeless simplicity of a game like Bomberman is, after all, hard to mess up. Games like Puppet Knight on the Mega Duck do a great job of taking the basic premise and making it work on a handheld. Sadly, Bomb Blaster doesn’t succeed for a number of reasons. The basic premise of Bomberman is straightforward enough, traverse a gridlike maze, dropping bombs strategically in order to rid it of its denizens and collecting power-ups to make the task easier as you go. Where the game truly succeeds is in its multiplayer mode which has long since become the stuff of legends on consoles like the SNES and Sega Saturn. If you reduce Bomberman back to its solo player roots, however, then you are going to have to do something to keep things from getting repetitive. 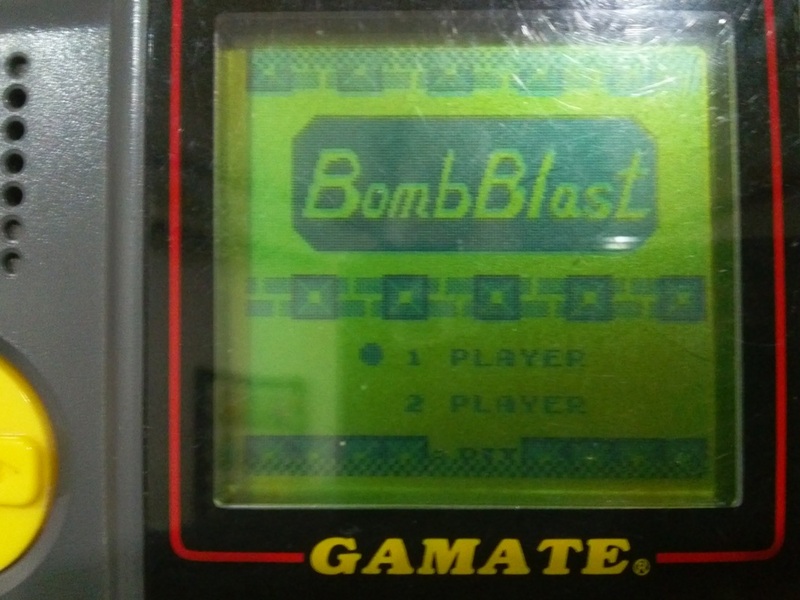 Bomb Blaster has a 2 player mode, but it’s only of a simple ‘pass the Gamate’ version, that sees players swapping over each time the player loses one of his three lives. It’s a commendable extra but also leads to the same frustration players of the original Super Mario Bros often experienced, as they waited for the more experienced player to die only to die themselves in seconds through beginner mistakes. Dying in seconds is certainly something you’d better get used to in Bomb Blaster, as the game uses an annoying randomiser to allocate not only maze layouts, but also enemy placement, meaning that stage 1 for Player 1 won’t necessarily be the same stage 1 that Player 2 gets, or indeed the same stage 1 that either of them were playing on their previous life. The same irritating randomisation to player spawning also means that you may well begin a stage placed in a 1 by 3 grid, blocked in WITH AN ENEMY! This happened the first time we booted the game up and led to the instant loss of a life within 2 seconds. Get used to this sort of quality screenshot capturing for a system that has no dedicated emulator and can only be photographed clearly from precise angles! 'Moverage' doesn't even begin to summarize it! Note also, how it can't even fit it's own title on its title screen! Speaking of enemies, they also deserve their special section in Room 101. 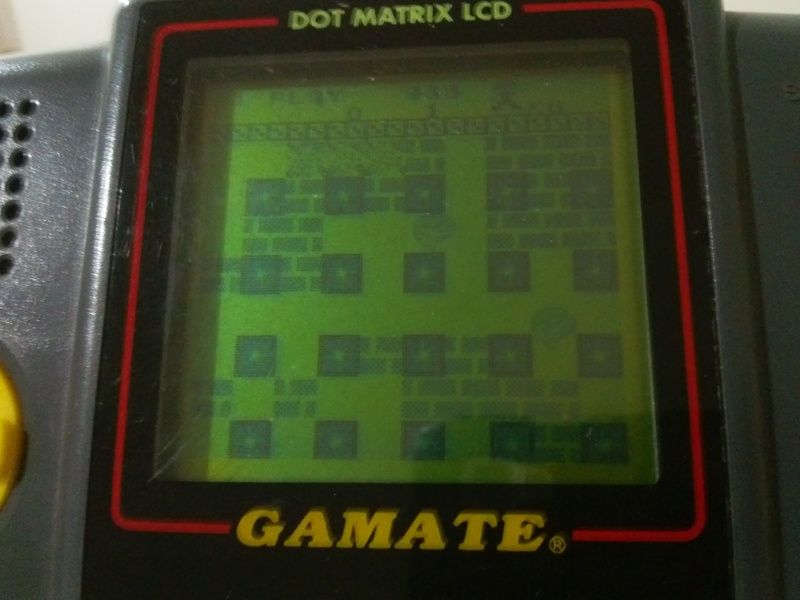 While it appears that there are several enemy types, each with their own Pac Man logic (some will run some will follow, some can pass through walls and even go outside of the game area only to somehow pop back inside and grab you) it’s next to impossible to determine one from the other as the developer (or possibly the Gamate itself) has rendered them all as partly transluscent constantly flickering blobs. This does seem to have been an odd stylistic choice as the main sprite is solid enough even if he does move with the jerky motion of the average Game & Watch protagonist. The random nature of the mazes is somewhat balanced by the fact that the game is not terribly difficult, merely unpredictable. As we mentioned earlier, it’s hard to mess up a winning formula and for what it’s worth, the game doesn’t play a terrible version of Bomberman, just a really rather uninteresting one. There only appear to be three types of power-ups, a pizza that speeds up your player (complete with added ghosting) the ability to drop more than one bomb at a time or bombs with a slightly increased blast radius (although nothing like the continuous levelling up found in Puppet Knight). This is rendered even more redundant by the way in which any power-ups you have gained are lost upon successful completion of the level, something attained simply by killing every enemy in the maze. In theory Bomb Blaster was a good idea for a Gamate title. Bomberman should, and does work well, as a handheld title, even one with a notoriously poor screen. Bomb Blaster’s version is not un-enjoyable or irredeemably incompetent; it’s just more than a little bit dull and suffers from design choices that are as inexplicable as its garbled attempt at music. It’s worth noting, however, that perhaps the developers were in on the joke. 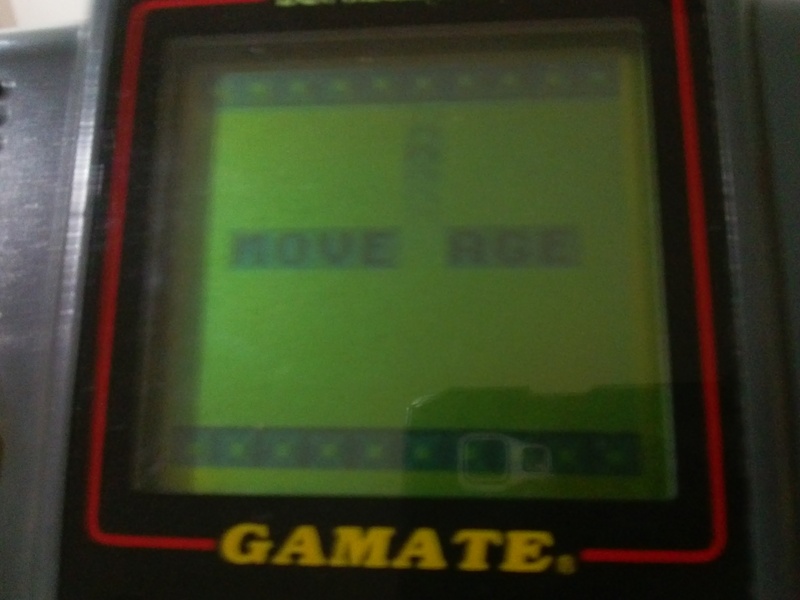 When you lose the last of your three lives, then the phrase “Move Rage” appears on-screen, only to unscramble into the more familiar phrase ‘Game Over’. It’s a neat moment that reveals a sense of humour in a developer no doubt given a ridiculously short deadline to push out a Bomberman clone. It’s a shame that, whether as a result of that timescale or not, Bomb Blaster doesn’t have another single original thought to share.